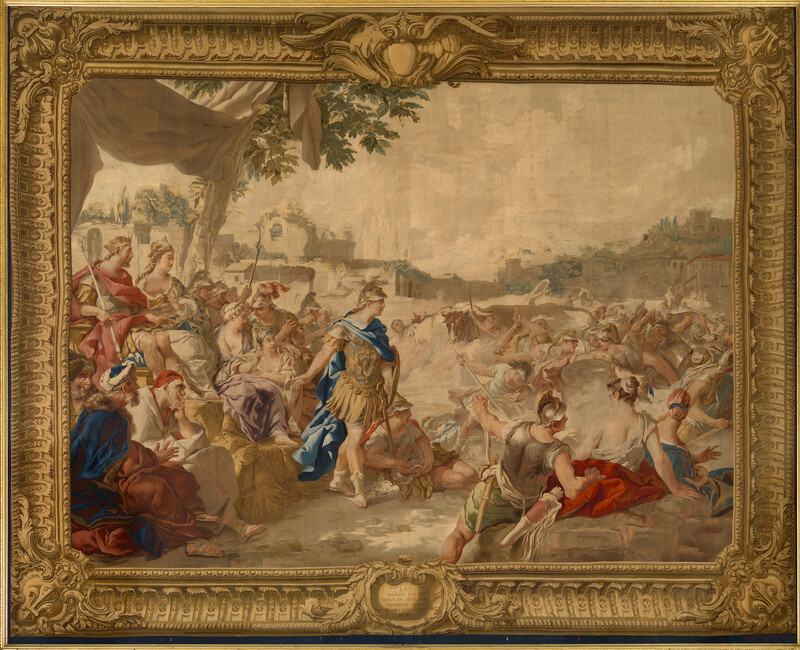 Eight panels from a series of Gobelins tapestries depicting the Story of Jason, each with a border representing a gilt frame. Woven c.1776-1779 in the workshop of Pierre-François Cozette and Audran after designs painted between 1744-6 by Jean-François de Troy. 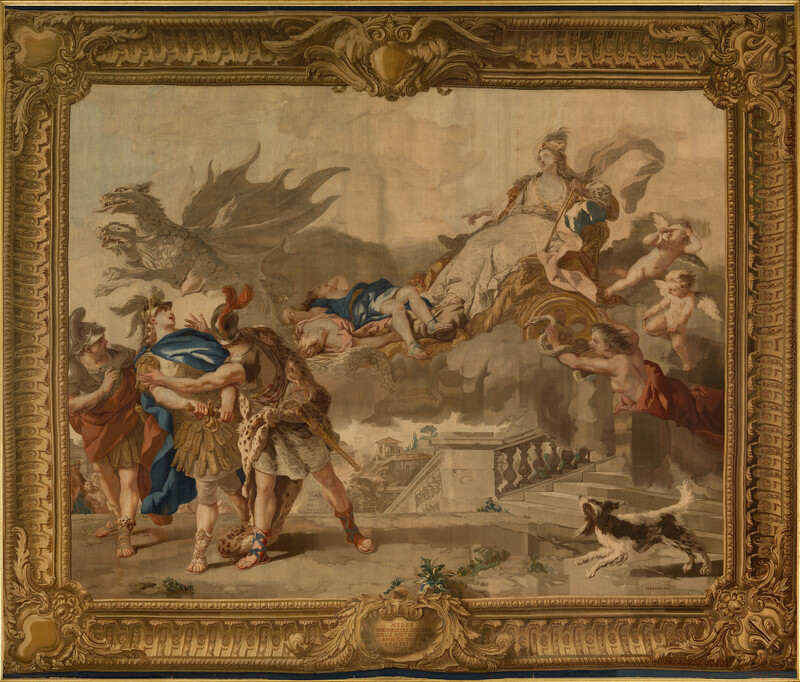 The scenes depicted are: Jason pledges his faith to Medea, who promises to help him with her sorcery; Soldiers sprung from the dragon's teeth turn their weapons against each other; Jason puts the dragon to sleep, takes possession of the Golden Fleece and departs with Medea; Jason, unfaithful to Medea, marries Glauce, daughter of King Creon of Thebes; Glauce is killed by the magic robe presented to her by Medea; Medea stabs her two sons by Jason, sets fire to Corinth and departs for Athens. 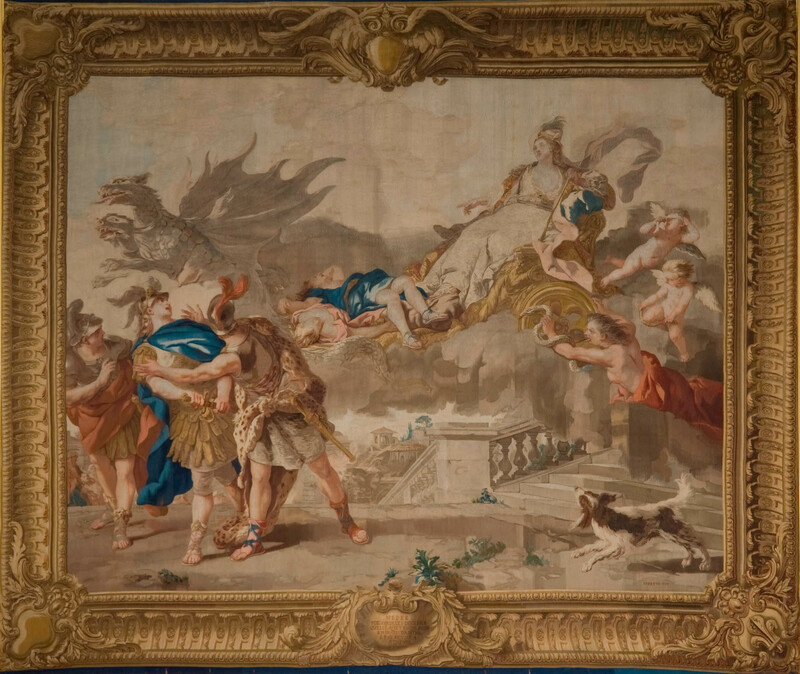 This complete set of tapestries at Windsor Castle, including duplicates of two of the designs at Buckingham Palace, depicts the story of Jason, captain of the Argo, and Medea, the wife whom he later forsakes. 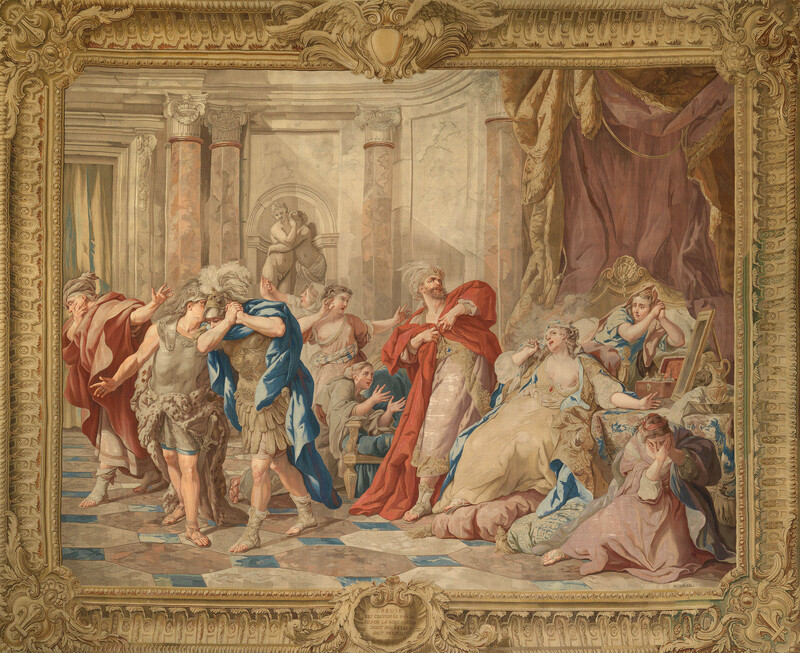 Medea's father, Aeëtes, has set a series of tasks which Jason must overcome in order to obtain the Golden Fleece; Medea has fallen in love with Jason, and, having received his pledge of fidelity to her, uses sorcery to help him. First he must yoke a pair of fire-breathing oxen and plough a field – Medea provides a magical ointment to protect Jason from the flames – into which he must then sow dragons' teeth. The sown teeth erupt into an army of soldiers, which Jason distracts with a stone thrown into their midst. Confused, they attack each other and he escapes. The Fleece is guarded by a sleepless dragon, which Medea subdues with a potion. 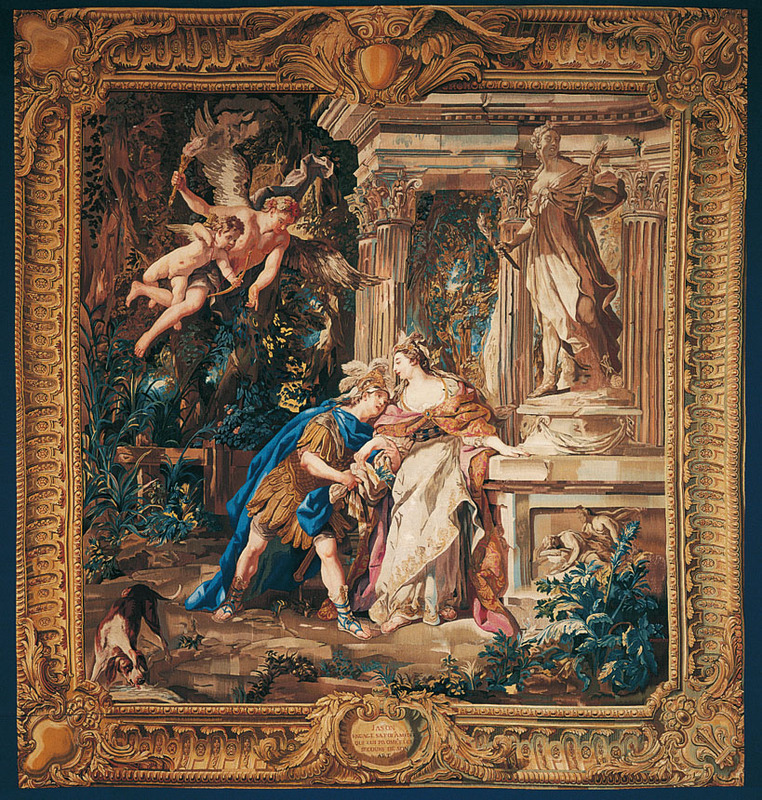 However, having killed the dragon and departed with Medea, Jason is beguiled by Creuse (otherwise known as Glauce), daughter of King Creon of Thebes, whom he marries. 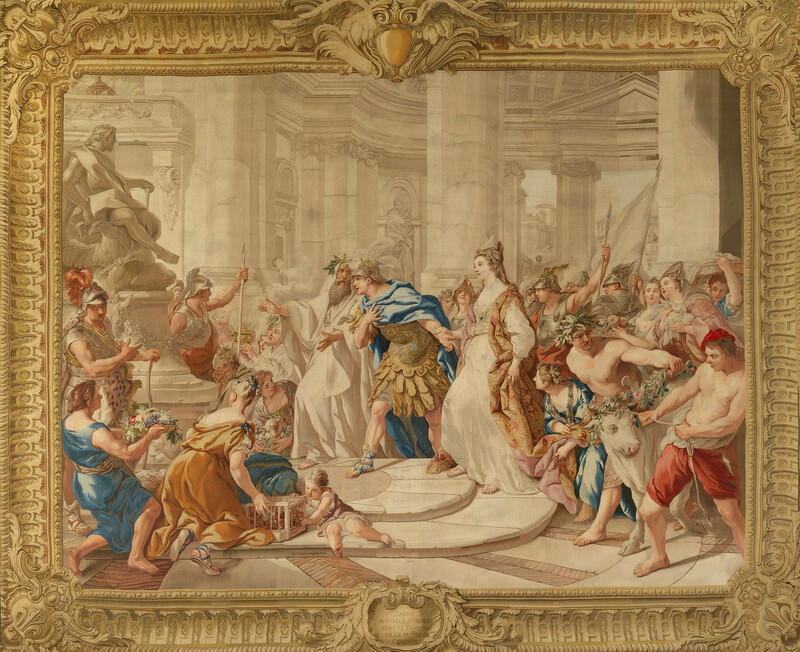 Medea, unhinged by jealousy, sends a poisoned cloak and crown to Creuse, killing her; and murders her own two sons, before setting fire to Corinth and departing from Athens. The two tapestries in Buckingham Palace are duplicates: the full set of six are shown at Windsor. The Palace ones are the soldiers fighting against each other; and the burning of Corinth. 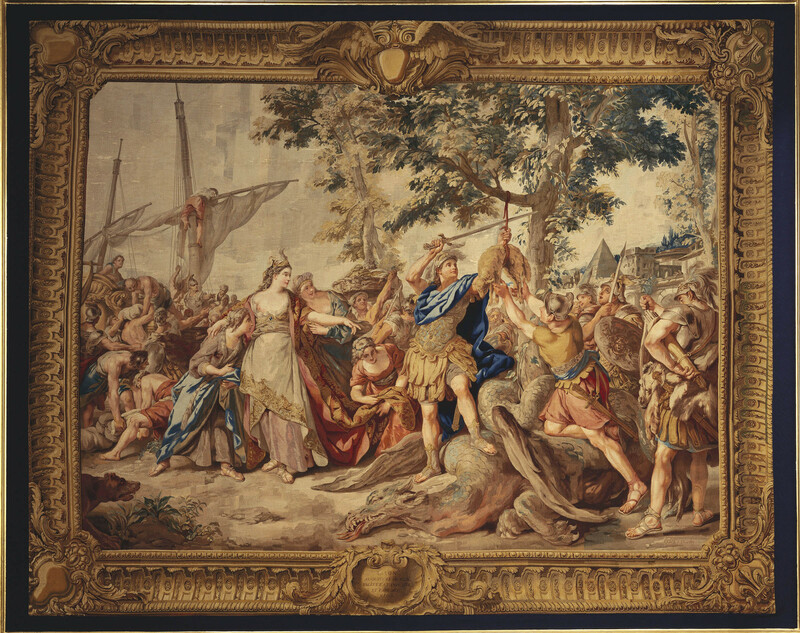 This tapestry was sold during the revolutionary sales to the Citoyen Chapeaurouge, agent of the Commission des Subsistances in Hamburg. 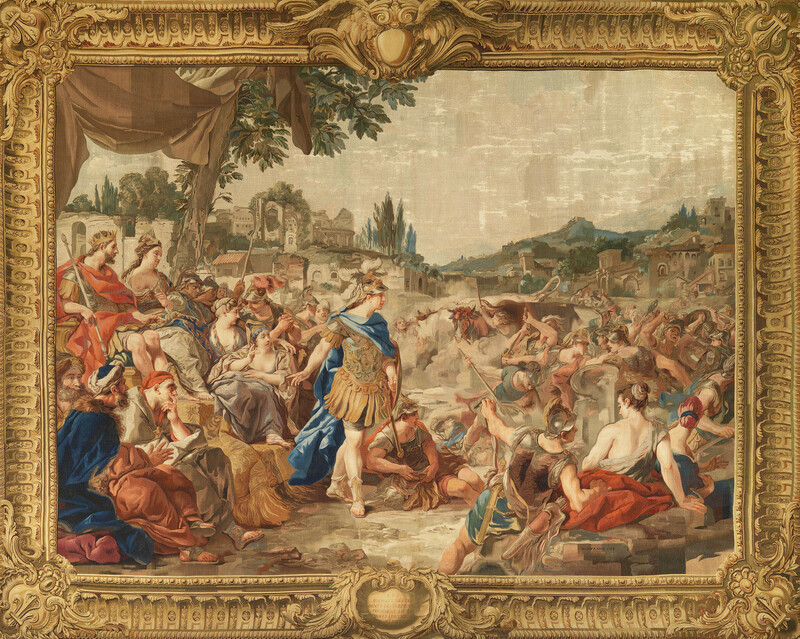 It was purchased in Paris in May 1825, along with 37 other pieces of Gobelins tapestry, by Sir Charles Long (later Lord Farnborough) on behalf of George IV. Jason assoupit le Dragon, enléve la toison d'Or et part avec Medée. Les soldats nés des dents du serpent tournent leurs armes contr'euxs memes. Medée poignarde les deux fils quelle avait eus de Jason, embrase Corinthe, et se retire a Athenes. Jason engage sa foi á Medée qui lui promét les secours de son art. Creuse est consumée par le feu de la robe fatale dont Medée lui a fait present.